Sleeps 10 This is the view from the terrace, living room, dining room and two of the bedrooms, over the Gulf du Morbihan with Iles aux Moines in the distance. This beautiful large house commands these beautiful views and enjoys use of a slipway to launch boats (a rowing boat is available). 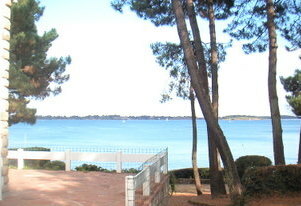 It is just outside the village of Larmor Baden and a short drive to larger towns and the city of Vannes. This is the view from the bottom of the garden, and it is literally a short path to the sea (10 metres!) You will find the house at the bottom of a wooded lane, in a quiet and secluded area. There are six bedrooms, one of which is on the ground floor is an ensuite single room with bathroom and shower over, toilet and sink. French windows lead on to the terrace and the wonderful sea views. L-R lounge, TV room, kitchen & dining room (click any photo to enlarge) The lounge is large and comfortable and there is a television (with French satellite reception) room to one side, again with the views of the gardens and sea. The kitchen is fully equipped with full gas cooker, microwave, dishwasher, fridge freezer and upstairs in the laundry room you will find a washing machine and tumble drier. Upstairs there are five further bedrooms. Two doubles one with sink, and three twin rooms. Further family bathroom and a separate shower room upstairs too, each with sink and bathroom. Bed linen is supplied but you will need your own towels. There is WiFi which is charged at 30€ per week as it is switched on and off as required. 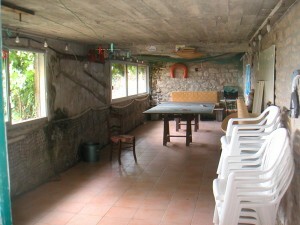 Down in the basement you will find table tennis, access to the garden and the little rowing boat is stored there too. The house has WiFi.